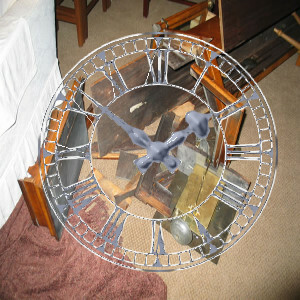 ﻿Bruce Goodman's "Timed to perfection"
Lambert was determined to adjust the time on his grandfather clock to perfection. When he started to fine-tune it, it was gaining three minutes every two weeks. With a little adjustment, it was losing just over thirty seconds every week. And then perfection came! The clock maintained perfect time when he measured it weekly for four weeks. That was when the earthquake (only a little one) tipped the clock over and smashed it to smithereens.